Microsoft has release the Network Client for developers to create applications that access network drives. It works without any further modifications for accessing Windows 9x/ME/NT/2000/NT Server network drives as well. You can connect any way you can think of via TCP/IP just as long as you have a DNS or WINS server configured. This includes USB, Ethernet, RAS, IrDA as well as serial. In order to use the Network Client with your Handheld PC 2.0 you must install the Network Client from the Microsoft Developer Downloads on your Handheld PC. The Handheld PC Pro, and H/PC 2000 has this client already installed. This client is compatible with the Palm-size PC if you load the Network Client and a the PalmBrowser or IBrowser listed on my Web Browser FAQ. Palm-size PCs with Windows CE 2.11 require an updated versions of the Network Client available from Foliage Software. Right now there is no Pocket PC Network Client. Microsoft offers the Network Client for developer use and does not offer support for it. Don't forget to reset the unit after installing the Network Client. Once you have installed the Network client, you also need a DNS or WINS server to provide name resolution. Note: You can use the desktop's IP address as the device's WINS Server. By default, Microsoft has named the devices Handheld_PC and Palm-size_PC. Both of these names contain invalid characters for naming a WINS device. The names can only be from 1 to 15 characters, a leading character in the range 'a'-'z' or 'A'-'Z', and the rest of the characters in the range 'a'-'z', 'A'-'Z', '0'-'9', or '-'. I recommend that all users rename their device prior to synchronizing or using them on a network to guarantee compatibility. This is done in the Control Panel - Communications. You must synchronize again with the serial cable and Windows CE Services will treat your device as if it has never been partnered with that desktop. Also, on the desktop PC you need to enable sharing in the Control Panel - Network - File and Print Sharing. 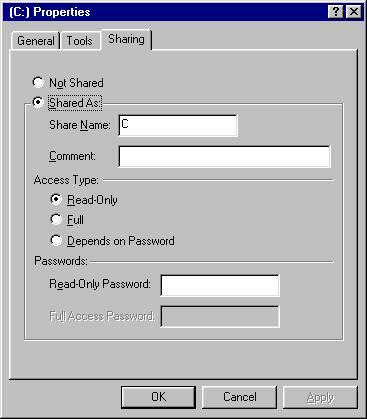 For Windows NT users you will need a username and password that is authorized to access the drive you want. To connect to the above server called DESKTOP and access the shared drive labeled C double click on Internet Explorer and type \\desktop\c as the address. This address is called a Common Internet File System (CIFS) address. The server name and shared drive are not case sensitive. You can then select files to copy and paste them to/from your Handheld PC and desktop (long filenames are visible). You can create shortcuts to commonly accessed servers/drives/directories/files and double click on html, programs (look for the program specific icons), Pocket Word, JPEG, and GIF files to launch them but not text files or Pocket Excel Files. Also, the File Open dialog boxes dos not support accessing files on servers. You can print a plain text file from your Handheld PC to a network printer that is attached to a network accessible Windows 95- or Windows NT-based system. First, find the specific file you want to print on your device in the file browser (do not open it in Pocket Word). Then select the Copy command from the Edit menu. Next select the printer on the associated server (for example, \\Desktop\printer) and then use the Paste command from the Edit menu to print the file. You cannot print Pocket Word or Microsoft Pocket Excel files with this method. If necessary. you can export a Pocket Word document to plain text by opening it in Pocket Word and using the Save As... command under the File menu. The Handheld PC Pro supports network based printing directly out of the box. Any file you copy will NOT be converted to/from Pocket formats and desktop formats. Also, be careful not to try to look at the properties of a shortcut for a network drive - the Handheld PC will try to access it and crash. Finally, you can not browse the network like you can with Windows 9x or NT/2000 but you can browse the shared resources on a specific server.. You must know the exact server name and share name in order to access it. Also, if you are using a WINS server, you can only access hosts that are registered to that server. If you choose the clear text password the password can be seen via a sniffer. By default, Microsoft has named the devices Handheld_PC and Palm-size_PC. Both of these names contain invalid characters for naming a WINS device. The names can only be from 1 to 15 characters, a leading character in the range 'a'-'z' or 'A'-'Z', and the rest of the characters in the range 'a'-'z', 'A'-'Z', '0'-'9', or '-'. I recommend that all users rename their device prior to synchronizing or using them on a network to guarantee compatibility. For troubleshooting tips for your network connection read the Network Troubleshooting FAQ. If you find an error or can add to in the information provided above, feel free to e-mail me at [email protected] Pocket PC FAQ.